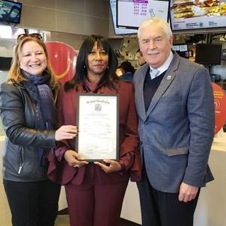 Neptune resident Marty Gillis, owner of McDonald’s in Neptune, received a proclamation from Assembly members Joann Downey and Eric Houghtaling in honor of Women’s History Month. Neptune McDonald’s Owner/Operator Marty Gillis was recently presented with a joint proclamation from Sen. Vin Gopal and Assembly Members Eric Houghtailing and Joann Downey of the 11th Legislative District for outstanding service to the community. In addition to serving as a McDonald’s owner and operator Gillis has partnered with local organizations and schools and has held fundraisers across many of her restaurants to benefit and further a variety of causes. She has hosted Coffee with a Cop events to encourage local law enforcement and the community to build dialogue; donated items to local sports teams; and provided children with school supplies to give them the tools they need to succeed. She operates her business with her son, Julio Morgan Gillis, who is also a McDonald’s owner and operator.